Adopt the Dashboard Report – your one-stop report - for improved visibility on all data synchronisation processes. With Shoper’s comprehensive data synchronisation, you now have access to simplified, consolidated data and store-wise data management. Identify pending POS information and display day status’ after your last synchronisation. Choose from three product editions - Silver, Gold, and Diamond - based on your business type and requirement. When you have more than one store and one or more warehouses, central management may be required for your business. Shoper 9 HO fulfills these requirements. What can you manage centrally? When the same SKU (stock keeping unit/item code) and categories are used uniformly, you can define these at the HO and have them flow to the POS locations. Other masters are also supported, including price lists, promotions, discounts, customer & supplier lists and taxes. Keeping in mind that connectivity can never be 100%, the data architecture is de-centralised. This means that each store has its own local database which is replicated at the HO. One additional advantage of having two copies of the database: in case of a disaster you do not lose your data! Data transfer between POS & HO is via the Internet. Several methods are supported depending on the local connectivity conditions – each store can opt for one that suits it best. This data synchronisation can be scheduled at regular intervals, and controlled by the HO. All decision support is available centrally at the HO. It lets you access over 100 reports taken across stores & groups of stores (grouped any way you want). When you need to add another store, Shoper 9 HO supports rapid deployment. You can bring up a store to full operation in about half a day. Specific store settings and configurations can be copied into a template and deployed at the new store. All master information can be automatically pulled in from the HO. HO supports centralised management of indents from the store, generation of consolidated Purchase Orders and integration with warehouses for dispatches. 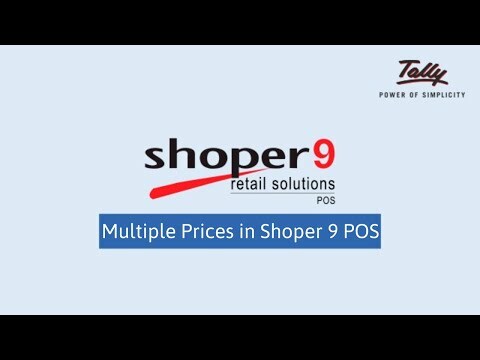 Shoper 9 POS is a powerful Point of Sale (POS) software to manage all your retail operations in a store or distributor location. It comes in two flavours – Retail or Distributor. Retail businesses –from a single store to a chain of stores selling different items –can use Shoper 9 POS. The application supports Purchase, Stock, Sales and Bar coding. Master data for items to be transacted can be entered or imported from other sources. Similarly, sales promotional schemes and discounts can be created. In a large retail chains, the individual POS applications at the stores are controlled by the Shoper 9 HO application. The main strength of the Shoper 9 POS application is its user-friendly billing system that speeds-up customer service. The POS application reduces the amount of data entry work via importable text files. The application's extensive reporting system is useful to the store manager and management at HO. A complete interface with Tally.ERP 9 allows the posting of inventory information for the purpose of generating accounting, inventory and statutory reports. The Shoper 9 Silver Edition allows you to install and run Shoper 9 POS. If you run a retail store, you can use it as a POS component, or else as a Distributor component if you function as a Distributor. The Silver Edition runs on a single machine. The Shoper 9 Gold Edition allows you to install and run Shoper 9 POS on an unlimited number of terminals in a LAN (but within the same sub-network). You can use it as a POS component or Distributor configuration on multiple terminals in a sub-network. The Shoper 9 Diamond Edition allows you to install and run Shoper 9 POS as well as Shoper 9 HO on as many computers in a LAN (but within the same sub-network). You can use it as a HO or POS component in as many terminals of the sub-network. If you want to control the operations of the stores, or distributors spread over a wide geography, then you need to install Shoper 9 Diamond.